When it comes to holy grail comic books, Amazing Fantasy #15 is definitely one to put on the list. The long list of first appearances in this issue sets up the world of Peter Parker. 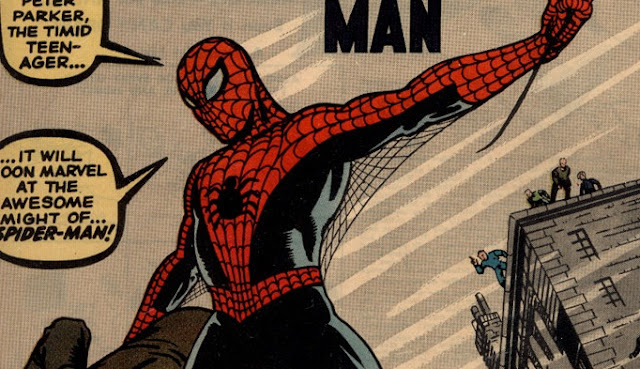 Spider-Man was created by the legendary Stan Lee and sports a cover by, the also legendary, Jack Kirby. This iconic cover is often copied, also known as a "cover swipe" in industry terms, by other artists including Todd McFarlane. I've included a few of the cover swipes at the bottom of the page if you're still a little confused about them. By now, everyone knows the origin of how Peter Parker came to be the Amazing Spider-Man. Thanks to the movie franchises starring Toby Maguire and Andrew Garfield, people that don't know much, or anything, about this comic, know about Spidey's origin. So I'm not going to get too in depth about the bite from a radioactive spider that gave Peter his super powers. Let's talk a little about the other first appearances in this beast of a comic. We'll start with Uncle Ben and Aunt May. Benjamin and May Reilly Parker took in Peter and raised him after his parents were killed. Who his parents are or how they were killed is never mentioned in this issue. Sadly, Peter Parker loses his uncle toward the end of this issue. He is shot and killed by the Burglar. The Burglar is not a big part of the Marvel Universe, but he is a big part of Peter Parker's life. As I already mentioned, he is the one that shot and killed Uncle Ben. Earlier in the issue, Peter, dressed as Spider-Man, lets the Burglar get away as a security guard was chasing him. At this point in his life, Peter was only looking out for one person, himself. He blames himself for the death of his uncle and it's because of his death that he becomes the crime fighting, criminal fearing, friendly neighborhood Spider-Man that we all know today. Peter was the "bookworm" in high school, and like all bookworms, he had a bully. This bully's name is Flash Thompson. He would tease, taunt, and physically abuse Peter at school on a daily basis. 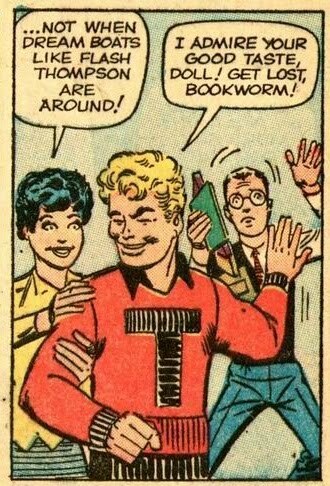 And finally, Liz Allen was Flash Thompson's girlfriend, who Peter had a bit of a crush on for a while, but of course, she would make fun of him too. Let's get to some graded copies of Amazing Fantasy #15. Looking at the CGC census, there are quite a few copies of it that have been graded, 2,480 to be exact. There are two Universal and three Restored highest graded 9.6 copies, however, most of the copies in the census are mid to low grade. Of the 2,840 copies, 2,102 are in 6.0 condition or lower and many are restored copies. Because so many of the copies in the market are a lower grade, that means the very few high grade copies are selling for lots and lots of money. At ComicConnect in 2011, a highest grade 9.6 copy sold for an astounding 1.1 million dollars, making it one of the most valuable comic books in the world. 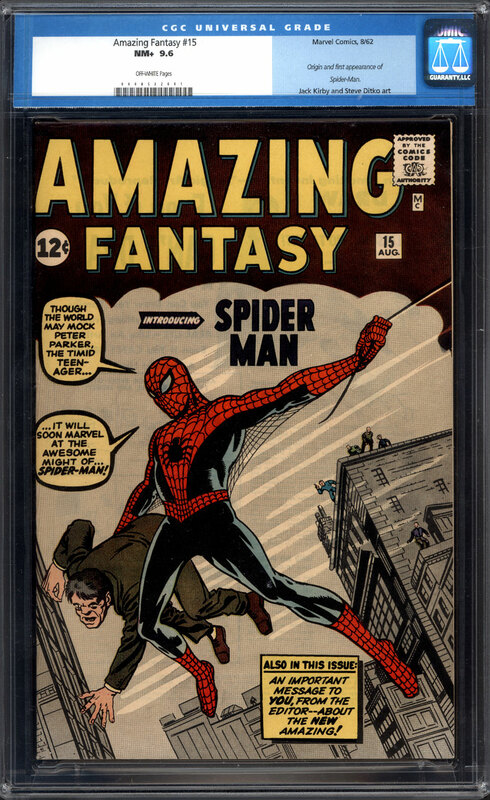 Even the lower grades of Amazing Fantasy #15 are pretty up there in price. Looking at the sales data from GoCollect, a 1.8 Good- copy sold for $7,800 in Feb. and a 1.5 Fair/Good CBCS graded copy sold for $5,500 on April 12, both of this year on eBay. That is mind boggling, but, it is the first appearance of one of Marvels most popular superheroes and this is a very sought out comic book that's on a lot of people's want list. I know it's on mine.